Ailsa Burrows studied Fine Art at university before working at a design agency and a couple of art galleries. She left the world of art galleries to gain a Masters in Children’s Book Illustration from Cambridge School of Art, where she discovered just how exciting adventures in the world of picture books could be. Is there a recipe for happiness? Meg certainly thinks so. 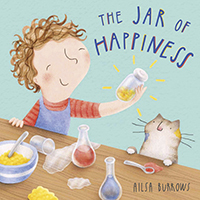 She collects all the necessary ingredients in a jar, which she uses to cheer up her friends and family when they're feeling low. But what happens when her special jar mysteriously disappears? Will Meg feel sad forever more, or will she find other ways to be happy?